We made it through the work week… is anyone else ridiculously happy that it’s Saturday? For whatever reason, a lot of my co-workers were in TERRIBLE moods all week… it’s quite a buzz kill, you know? And, as much as I love them (most of the time)… I was ready for a break. Moving on, I have a confession to make; I’ve totally been holding out on you. I wanted to tell you all, I really did! But I didn’t feel that the timing was right…and I just wasn’t quite ready to write it out loud. I wasn’t ready to see MY words in front of my face…so I kept it quiet. Anyway, I decided today was as good as any day to spill the beans… especially because today’s elf4health challenge is to announce our fitness goals for the coming year. Yes. 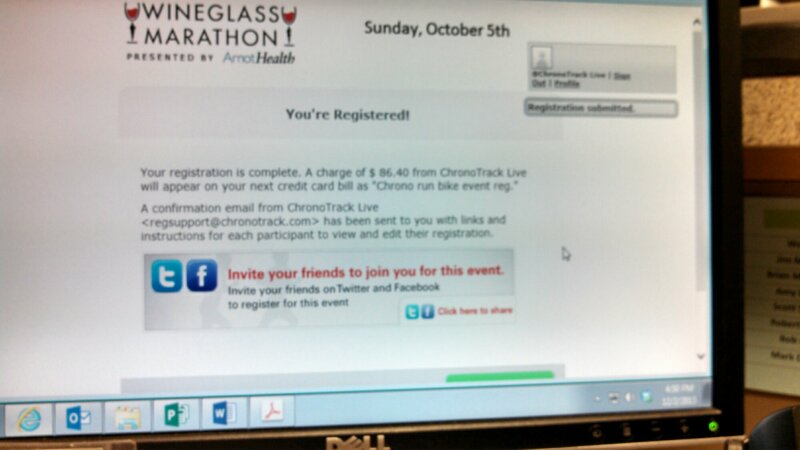 I am officially registered for the Wineglass Marathon. And I am SO EXCITED! While that’s not my only goal for next year, it’s certainly the biggest one at the moment. I’m on my way to marathon number two. Phew! I feel better now that I have that off my chest! What about you? Any races scheduled for next year? What are your fitness goals? The Army Ten Miler is so much fun…one of my favorite races! Depending on the date this year (and how I recover from Wineglass) I’d totally be down for joining you! Chelsea, that’s awesome! Which half marathons are you doing? And when is the full?! That’s so exciting! Good luck!